San Francisco’s LightHouse for the Blind and Visually Impaired and the Paul K. Longmore Institute on Disability at San Francisco State are proud to announce the lineup for this year’s Superfest Disability Film Festival. Join us on October 20 at The Magnes Collection of Jewish Art and Life in Berkeley and on October 21 the Contemporary Jewish Museum in San Francisco for the best in unapologetic, accessible and cutting edge disability film. Superfest is the longest running disability film festival in the world. Since it first debuted as a small Los Angeles showcase in 1970, it has become an eagerly anticipated international event. The festival is one of the few in the world to provide an accessible film experience to disabled filmgoers of all kinds. Disability Rights advocate Alice Wong speaks at Superfest in 2017. Each judge for Superfest is a member of the disability community, and they ground our festival in the values and ambitions of a progressive, Bay Area-driven disability ethos. The jury is comprised of filmographers, disability rights advocates, community organizers and award-winning creatives. They choose the submissions based on standards of artistry, portrayal of disability and ingenuity. Superfest features films from five continents which highlight a range of experiences of people living with disabilities through a variety of genres and formats. From observational documentary to action to stop motion, we have films which will entertain, educate and promote discussion on disabilities. A climber ascends a free-standing rock, while two people stand on a rock below her. Yu Xiuhua is a village woman with cerebral palsy, who became China’s most well-known poet in 2015. Her 20-year-long arranged marriage has become the biggest pain in her life. Through her poems, she contemplates her fate and writes about her body and her desire for true love. A woman stands with her back to the camera in a field of a dark, tall grassy crop. An artistic ode to the practice of stimming, or self-stimulatory behavior, the repetition of physical movements or sounds, or repetitive movement of objects. Lower-body shot of a child sitting cross-legged, grasping a blue plush toy with one hand. This semi-observational documentary explores isolation, art and transformation after brain injury. Through cinéma vérité, the film follows Dani Sanderson, a poet and beat boxer, as she navigates autonomy, relationships, and questions of family, queer sexuality and faith. When a tragic accident leaves Sarah grieving for her deaf partner Rob, she is forced to track down and engage with his estranged hearing father. To lay the man she loves to rest, Sarah must overcome a barrier far greater than language. Two women sit, both with looks of concern, gazing towards the left. The woman, at left, is in focus and wears a black shirt. Inspired by the true story about a young man, Just, who lost both of his legs in a childhood accident. At age 24, he is in love with the girl next door, and through an action-packed series of events, the film proves that looks can be deceiving. A young man rolls with his torso on a skateboard and arms pushing him past flowers in a market. Minnesota violinist and disability rights advocate Gaelynn Lea travels the upper Midwest on tour, experiencing the ups and downs of the road while hustling hard to make it as a performer and artist. A woman cradles a violin while leaning towards a microphone. A profile shot of a woman sitting in her car, looking distraught. With as much hope as doubt, Fabian and Lisa travel on a journey that will change their worldview. But is the Miracle Man (John of God) the savior everyone is talking about? And do they need to believe to be healed? A woman stands on a ledge in front of a fresh night sky with low, blue light in front of an open frontier. She holds her phone up to photograph the scene. 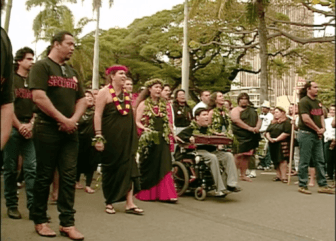 When 15-year-old Kanalu Young takes a dive into shallow water, he becomes quadriplegic, paralyzed from the neck down. Angry and defiant through months of rehabilitation, he begins to change when he learns the Hawaiian language, and discovers an untold story of Hawaiian history. A group of people walk in a march, and one joins in a wheelchair. The people wear leis and flowers, and men wearing shirts that say “Security” surround at the bounds. 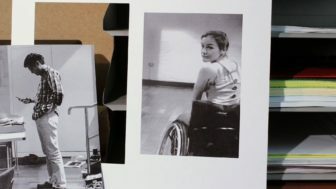 Photographs of performers in a disabled and non-disabled dance company come to life. The individual artists dance out of the photos and across table tops until the whole company meets and performs in unison. Two photographs sit upright beside a shelf of papers. At left, a man stands looking at his phone. In the photo at right, a woman sitting in a wheelchair smiles back at the camera. As always, Superfest will be furnished with a wide range of accessible accommodations: audio description, open captions, ASL interpretation, audience-integrated wheelchair seating, close-up seating for people with low vision or who are deaf or hard of hearing, a chemical free and scent free area set back from rest of audience, a place to retreat, gender neutral restrooms, easy access to public transportation including BART and MUNI, and ramp access to the stage. Reid’s short film On Beat, co-directed by Cheng Zhang, will be shown on Sunday, November 5 at The Contemporary Jewish Museum in San Francisco for 2017’s Superfest International Disability Festival. On Beat follows Larry and Tanisha Cotton, a Deaf couple with three hearing children. The family uses music to bond and express themselves. Davenport and Zhang discovered the Cotton family with another story in mind, having heard about Uber’s efforts to hire Deaf drivers (Larry is a driver), but once he came across their gospel group, he knew he had a different story to tell. The main thing Davenport wants other filmmakers to know is that with the proliferation of social media comes a unique opportunity. “The authority over the audience that they have is unprecedented, so they need to tell their stories.” He urges them to embrace stories about disability and not shy away from it. Professional voiceover artist and lifelong patron of the arts Michele Spitz is dedicated to making the world more accessible to people with disabilities by providing her vocal talents to filmmakers, publishers, speaking venues and charitable organizations. Wherever Michele’s voice is, her heart is also: short and full length documentaries, feature films, children’s programming, museums, industrial videos, audio manuals and PSAs. Michele is most passionate about her audio description work for the visually impaired — having voiced 37 films including documentary features. In addition to Michele’s audio description work, she also personally underwrites hundreds of patron attendance tickets, as well as artist interactive programs for the performing, visual and cultural arts world. This underwriting program serves: disabled, seniors, veterans and underserved communities. Michele has also provided her voice for our Superfest International Disability Film Festival, as well as for our headquarters — hers is the voice you hear on our phone system’s recorded greeting! In light of her unyielding support of LightHouse programs and the growing relevance of audio description as a force in media, Michele sat down with LightHouse’s Paul Blaney to discuss her passion for art and her unwavering support for those with disabilities. LightHouse: Why is supporting artists with disabilities important to you? Michele: Art is healing; we can all identify something in art that resonates within us. However, for the blind community, access to visual art can be challenging. It is my hope to ensure that visual art is appealing and accessible to everyone. LightHouse: What drew you to LightHouse for the Blind and Visually Impaired? Michele: LightHouse for the Blind is leading the way for those with blindness or low vision and supports the quest to identify and build community. Through trailblazing programs, resources, guides and activities geared specifically for blind people, LightHouse reinforces the need for accessible and meaningful support. LightHouse: What important message would you like to convey to those unfamiliar with artists with disabilities? Michele: Living with a disability should not prevent one from accessing and appreciating art. It is my hope (through audio description and underwriting performing arts programming) to expand awareness of the blind community, so everyone can deepen their enjoyment of art. LightHouse: How do you select your audio description projects? Michele: I often ask myself: ‘What haven’t I covered? What can I do next to support people living with disabilities?’ I want to be involved with projects that raise awareness and connect people to their community. Often, it’s lack of exposure that prohibits people from understanding the nuances of the art world. It’s my job to break stereotypes and give people ample opportunities to explore for themselves the interplay between art and humanity. LightHouse: What are your future plans for working with the disability community? Michele: I will continue to pursue partnerships with artists who push the envelope in developing projects with and for the disability community. My goal is to forge long-lasting relationships reflective of my passion for the arts, my desire to heighten awareness and, in doing so, attract more people to the cause. LightHouse: Thank you for chatting with us Michele! You may read more about Michele’s work at womanofherword.com.